Easter Eggs and Angry Birds! Can you tell our schools are closed for Good Friday today?!? I'm at home with my own kids today so I thought I would get them doing something creative to start our holiday weekend. 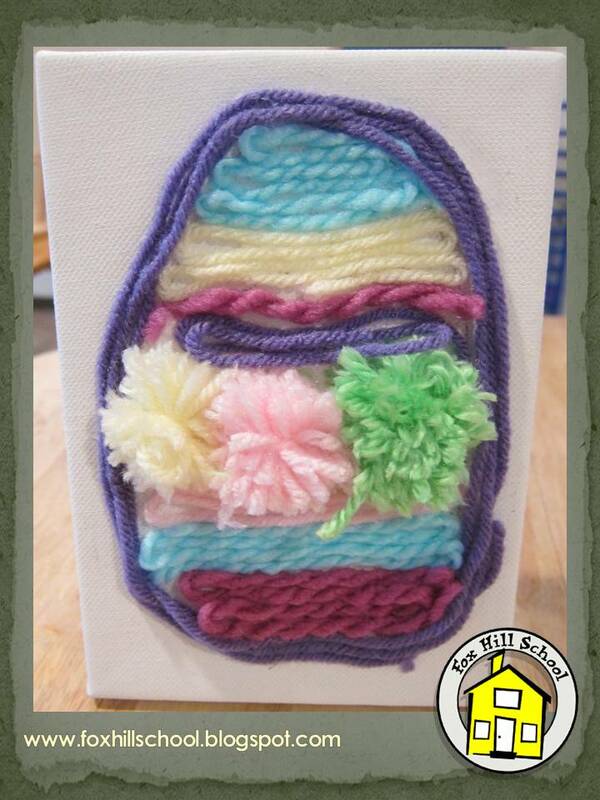 I saw this fun Easter Egg yarn project on one of the blogs I follow and I thought my daughter would love it. She's in 3rd grade and did great with the fine motor aspect of this project but I'm no so sure my preschool or Kinders would have the patience. All you need is some yarn, glue and a canvas. 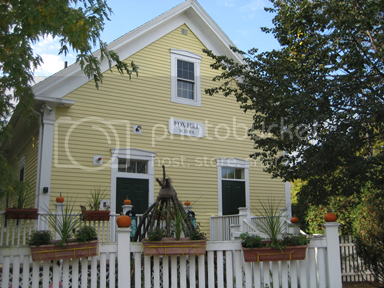 We used a 5x7 canvas but if you didn't have one it would work fine on sturdy card stock. Click here for detailed directions for this project! 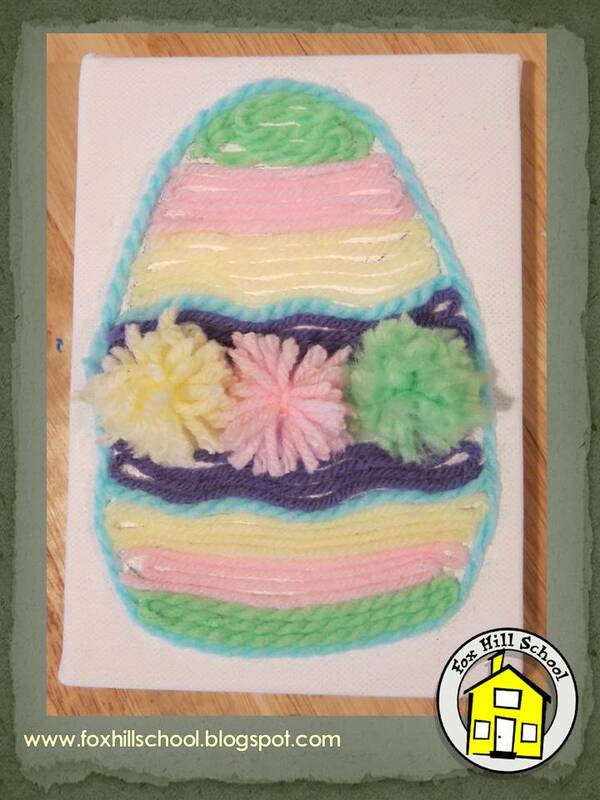 My son wasn't as into making an Easter egg so he opted for pom pom Angry Birds, which I also saw on the blog. Click here to see how to make the pom poms. He made red and blue pom poms for the birds and green pom poms for the pigs. 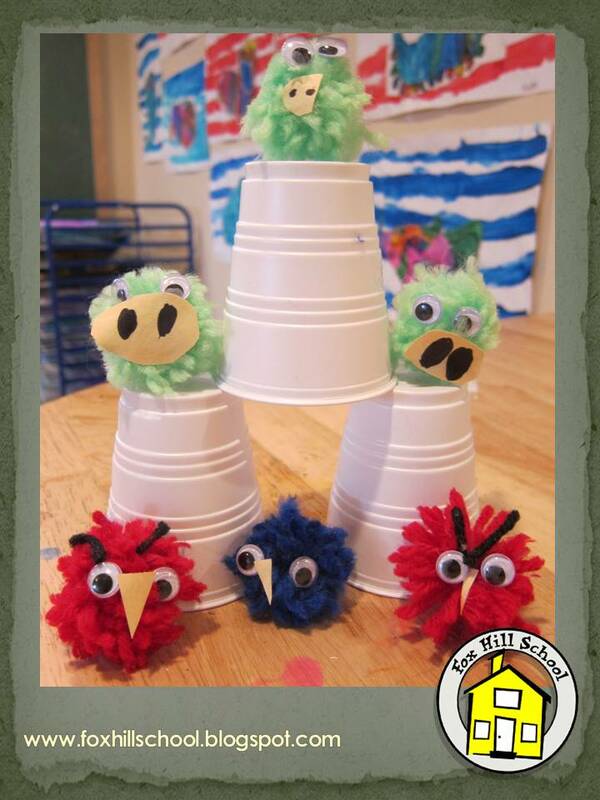 He glued googly eyes to the pom poms and made beaks and pig noses out of card stock which he also glued on. Then he set up a tower made from small plastic cups, set the pigs on them and threw the birds at the structure to try and knock it down. He's now looking for things to make a slingshot so we'll see how that works out! If you're looking for something fun and crafty to do with your kids on their day off, try one of these! My kids are having a blast! Happy Easter! We are still exploring our focus book entitled Vincent Van Gogh's Cat. One of the authors we learned about this week was Claude Monet. Years ago we had a guest artist (art teacher-grandmother of one of the kids in our school) who came and did a fantastic Monet-inspired collaborative project with our class. We decided to try it out for ourselves this week! We read a book called The Magical Garden of Claude Monet by Laurence Anholt. This cute story gives a little histrory about the artist and the illustrations reflect the style of his paintings. We asked the kids if they saw any white spaces left on the page when he made a painting. The answer? No! 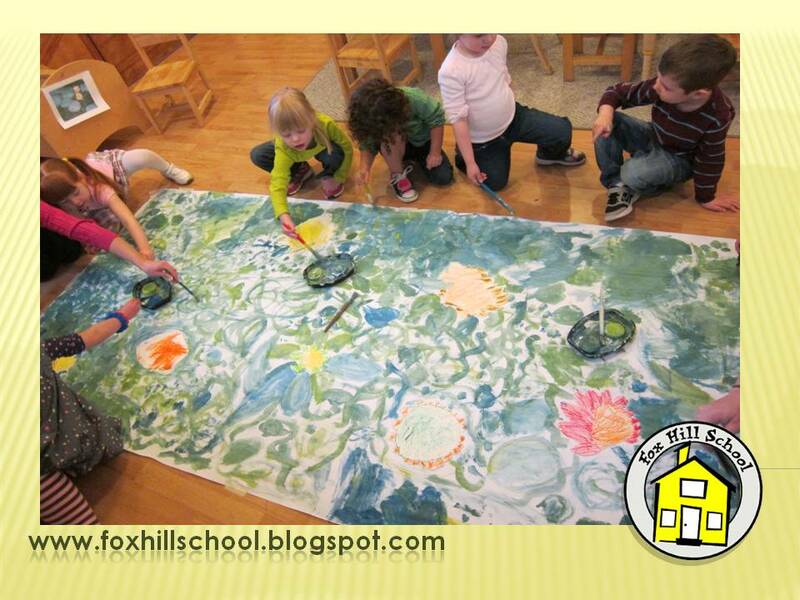 Then we explained that we would be making a giant mural like Monet would have made. 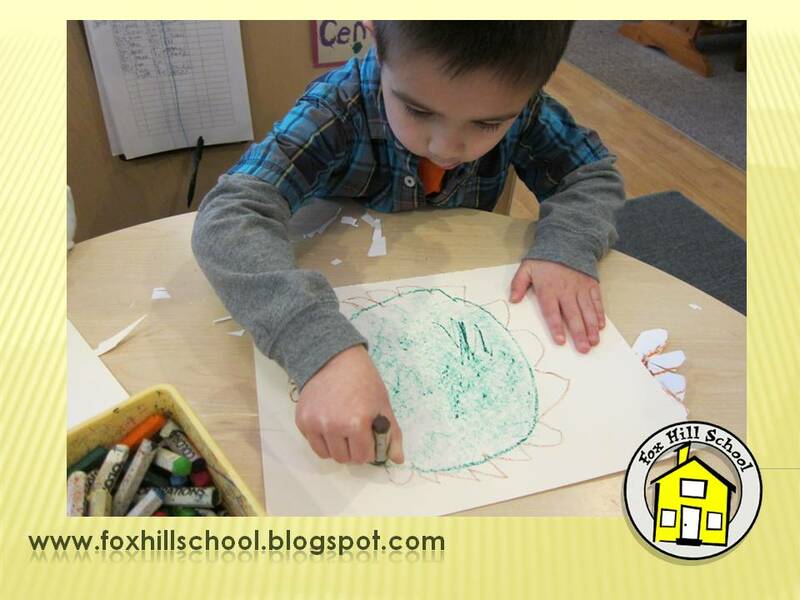 First we had our children who are going to Kindergarten next year make big flowers with oil pastels and cut them out. 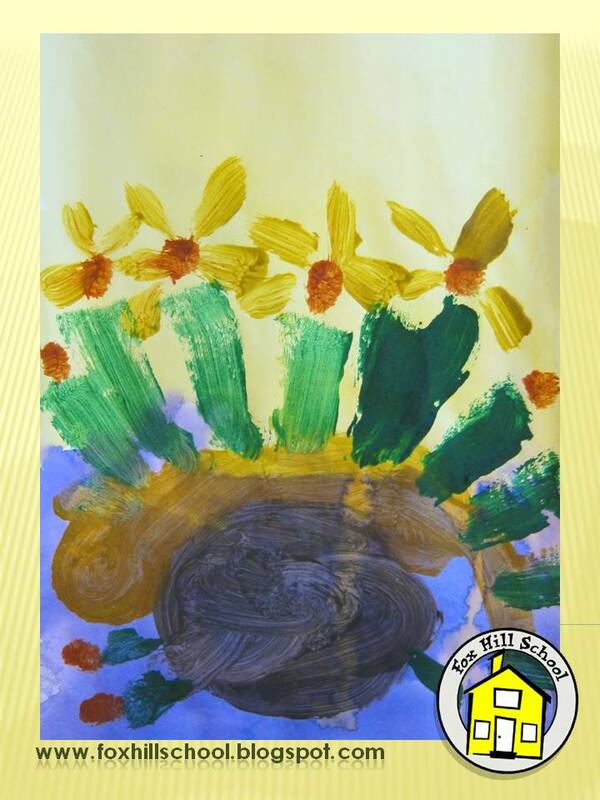 This mural will be displayed in our upcoming Kindergarten Readiness Art Show so our K-Readiness kids drew the special flowers! 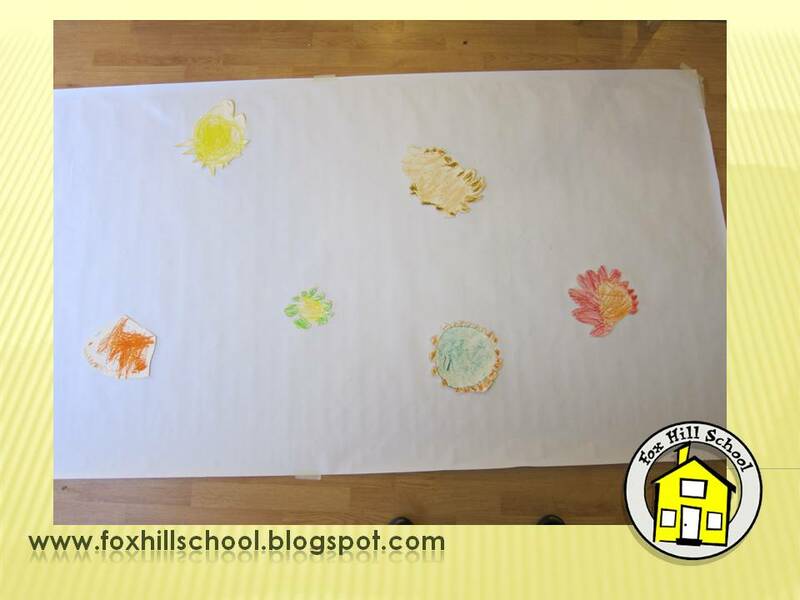 Then we glued the flowers randomly to a huge piece of butcher paper. 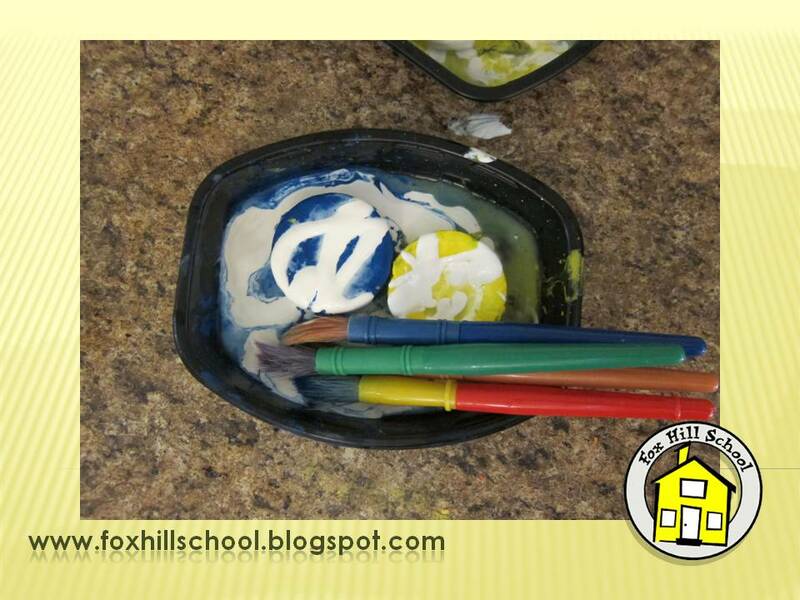 We put a yellow tempera cake, a blue tempera cake, a little water and some white liquid tempera paint in recycled microwave dinner containers. Then it was time for the fun! 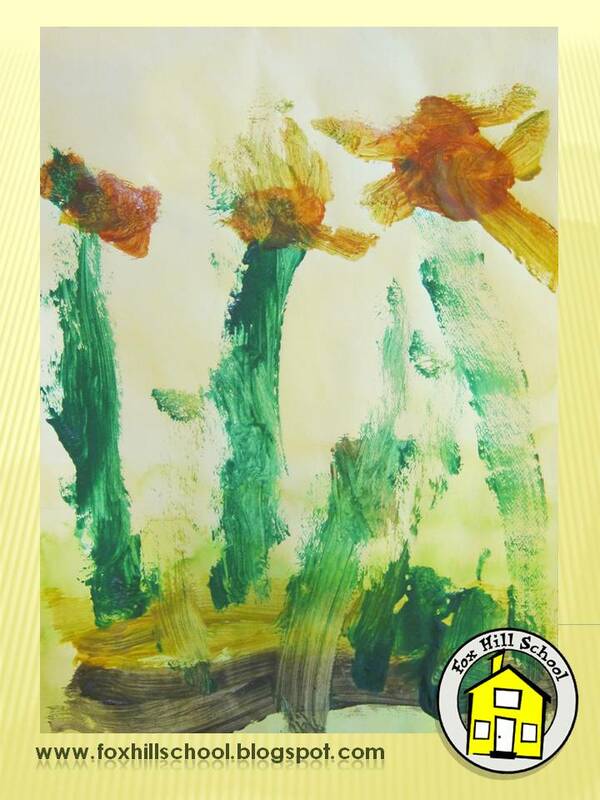 We told the kids that they needed to make leaves and vines for the flowers on the paper with the paint. All the children found a spot and kneeled next to the huge paper. We reminded them about their observation that Monet didn't leave any white spaces on his paper. 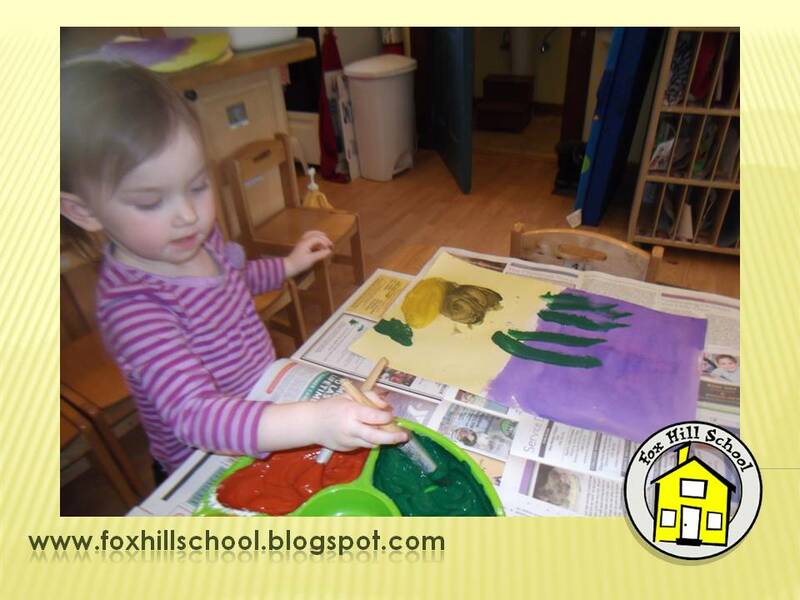 Some of the children were concerned that there was only blue and yellow paint available so we asked them what they thought would happen if they used both colors at the same time. Of course GREEN was the answer! Nothing like a little science mixed into an art project! The only instruction we gave after that was that if the paper in front of them was already covered with paint, they should move to a new spot because if the paper had too much paint in one spot it may rip. 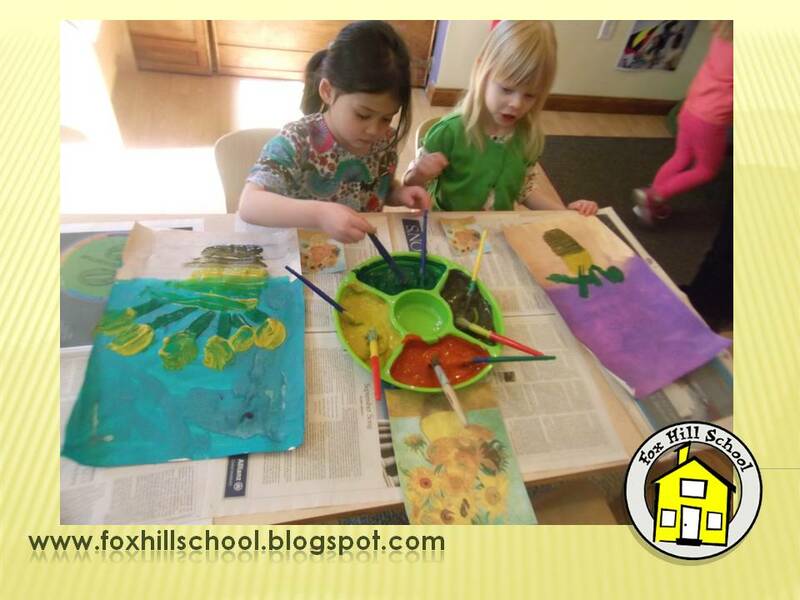 They had so much fun we could barely get them to put the brushes down when the paper was full! Check back in a few weeks to see the finished product when it is displayed at the Art Show! Here are some support books we have in our classroom for this unit. Click on the picture to purchase from Amazon. 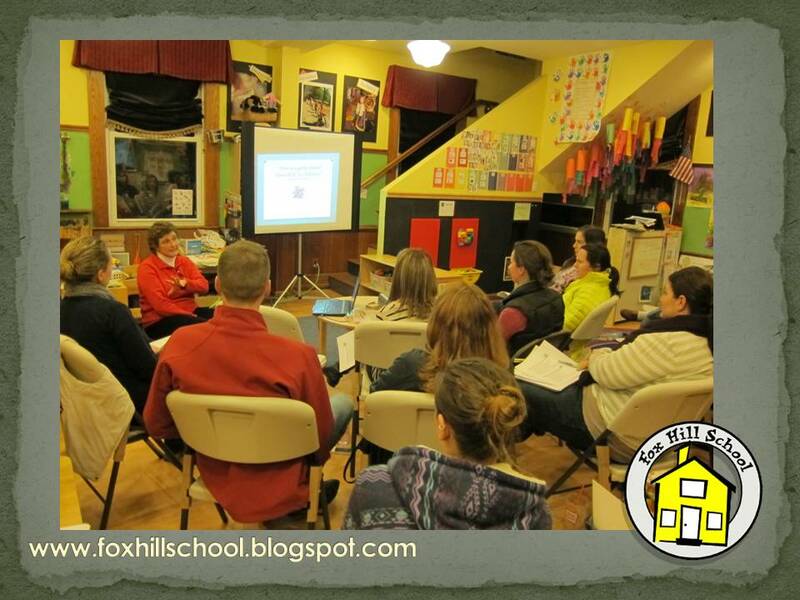 Last night we offered our families a parent workshop in place of our usual monthly parent collaborative meeting. Our guest speaker was Tere Bowen-Irish, OTR/L of All The Possibilities, Inc. She facilitated a workshop about the importance of play in children's development called "Child's Play - Let’s Play Alone, Next to and Together, Building Creativity, Independence and Intelligence…"
In addition to parent and teacher workshops, Tere has come into our classrooms to teach the children and teachers strategies and activities that promote strength and attention through a wonderful program she created called "Drive Thru Menus." The Drive Thrus are a series of short, fun and engaging activities that we have now incorporated into our daily routine that really help the children focus. Children will now actually ask to do these activities if they are feeling their bodies are not in control or they need to get out some wiggles before they are ready for group time. They incorporate children's literature as well so they really fit right in with our curriculum. One favorite Drive Thru is candlestick jumping! We put each child's name in place of "Jack" in this nursery rhyme and say "Reagan be nimble, Reagan be quick, Reagan jump over the candlestick!" Then it is Reagan's turn to get up and jump over the "candlestick" (in this case a block) that we have in the middle of the group time rug. They are encouraged to jump with both feet off the ground at the same time, which promotes strength and balance, and the kids are able to get up and move around which helps them with their attention once it is time to begin group time again. 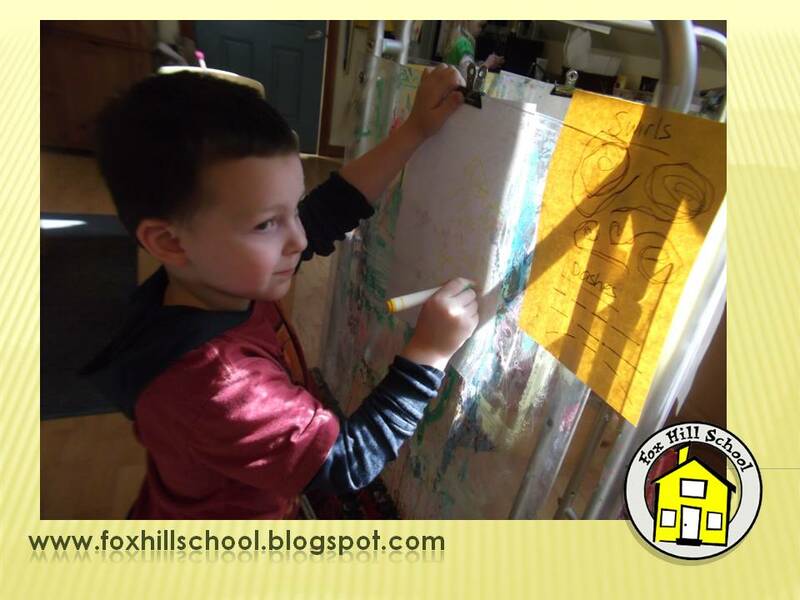 We regularly direct our families to Tere's website, All The Possibilities, Inc., because each month she posts a free download that has fun daily activities you can do with your child! In addition, Tere has written a fabulous book entitled Yoga and Me, Come Be a Tree, which is also available on her website. 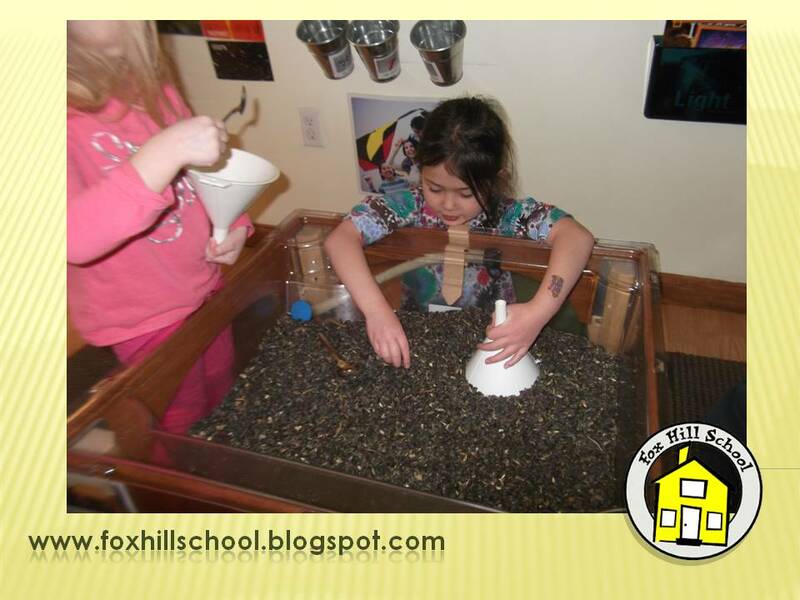 * Solitary play builds independent work skills necessary for future school work. * Parallel play allows the child to work next to others without distraction, problem solving independently but taking cues from the environment. * Cooperative play lays the groundwork towards working with others at any stage of life. * Consider yourself a concierge, custodian, tour guide or perhaps a gatekeeper. * No need to hover and control, but rather take on the role of tutor, facilitator and expander. *remember, it’s the process, not the product that is important. * Easy on the praise and protection. Allow your child to fail, re-group, go back and try again. End on a good note, take the opportunity to teach a lesson. * Encourage risk taking (within limits). Remember only this child had to fall a few times before they walked. * Ask open ended questions such as “How high do you think it can go?” “Where should we start?” “Why do you think that happened?” “Who do you think at your school would like playing this?” “When should we do this again?” You are stoking the problem solving fire! * Follow the child’s lead, for once you begin to direct, it is not play anymore. Thanks to Tere for yet another fun and informative parent workshop! These are some books about play that Tere recommended to our parents. Click on the book to purchase from Amazon. 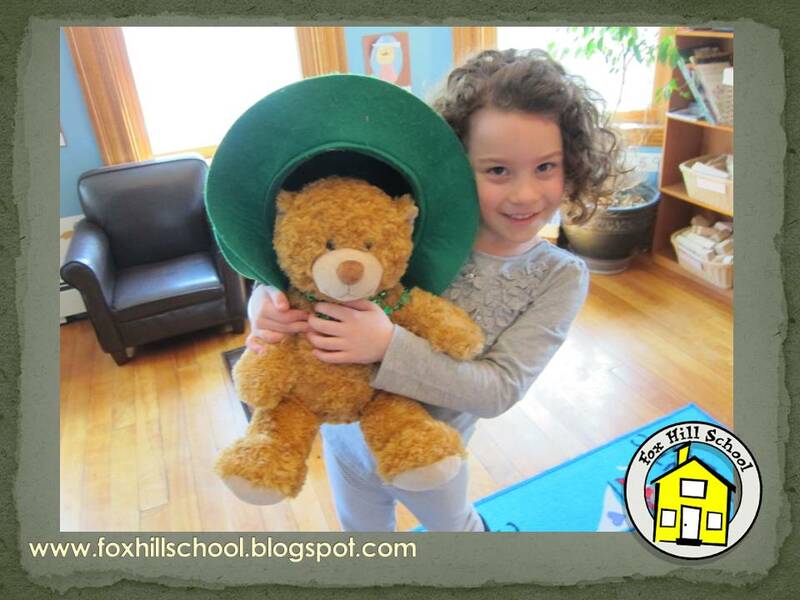 Readie is a bear that lives in our Kindergarten classroom. Sometimes he disappears with his suitcase and when he returns, he has always traveled somewhere exciting. When he comes back he always brings clues about where he has been. Readie has been to England and Canada and now he just returned from Ireland! He brought back a picture of the Irish flag and coloring pages of the flag and maps of Ireland. The kids were challenged to find Ireland on our globe and on Readie's world map and then color their own maps and flags. We also asked the kids to compare where Ireland is in relation to the other places Readie has been and asked how he could have traveled to each of these places (plane, drive, train, boat, etc). 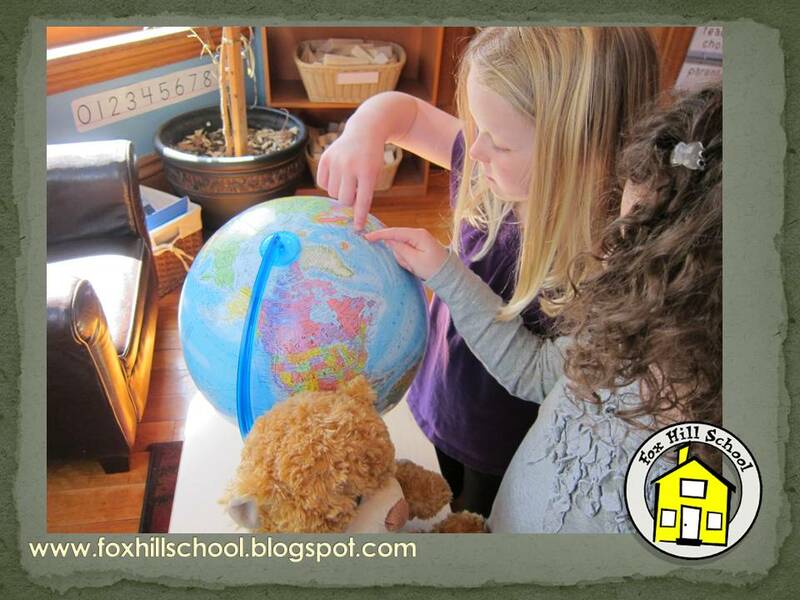 Having Readie teach us about geography is a simple an exciting way to incorporate a concept that may otherwise be a little difficult for young kids to comprehend. Thanks, Readie! We can't wait to see where you go next! 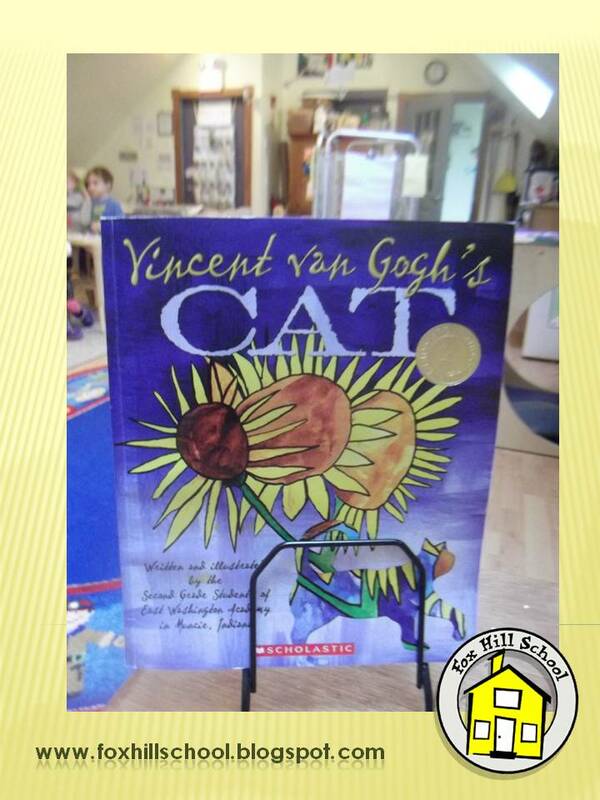 Our current focus book at the Fox Hill School is called Vincent Van Gogh's Cat. Although this sounds like it may be difficult to plan a full range of activities from a book about art, we have come up with quite a few activities that tie into this focus book nicely. 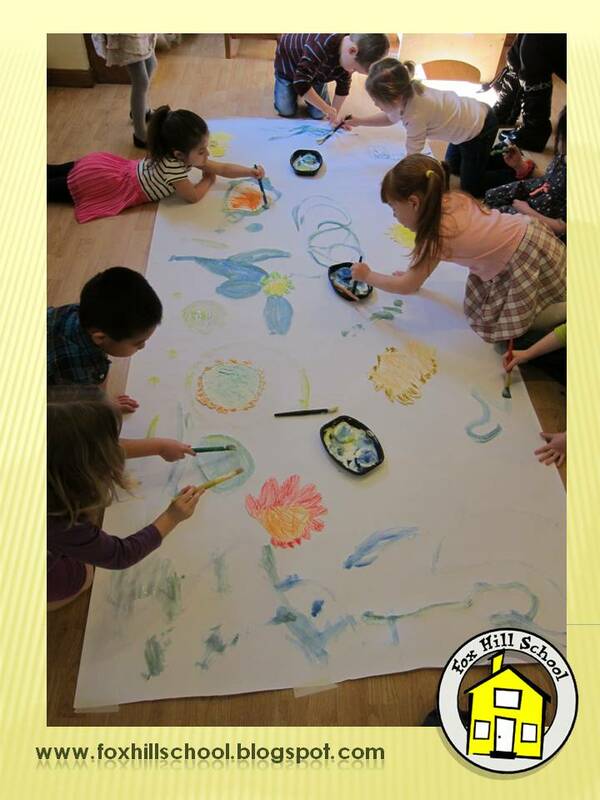 Since the first artist we learned about was Van Gogh and we painted our own version of his famous sunflower painting earlier in the week, we put sunflower seeds in the sensory table for the kids to explore. 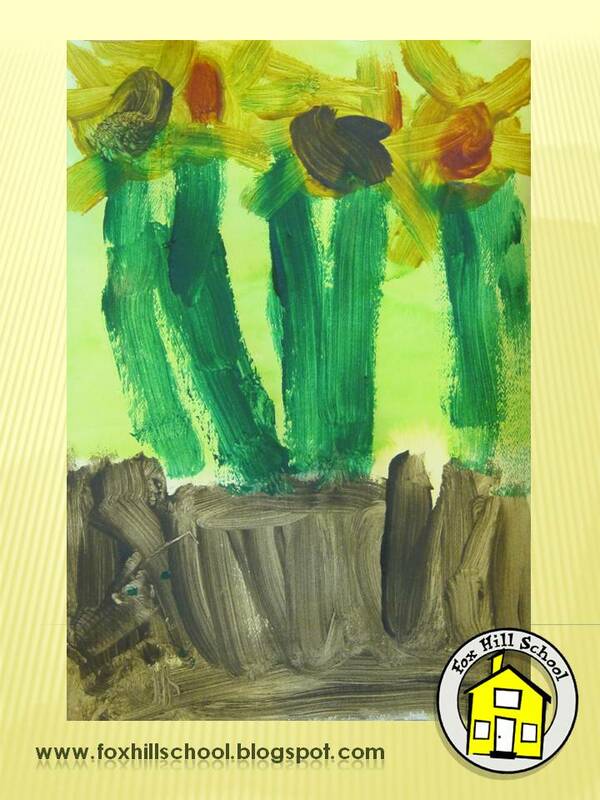 We showed them on the painting where the sunflower seeds are on the flowers for this science and sensory activity. 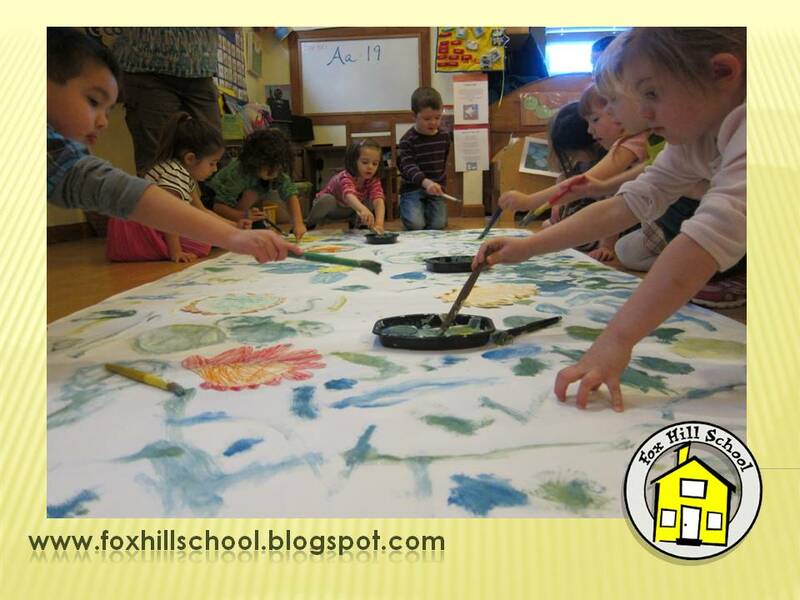 As a math activity, we made pattern strips using only the colors in Van Gogh's sunflower painting. The children were challenged to copy and then extend the pattern with Unifix cubes. I printed a few copy's of van Gogh's "Starry Night" and laminated them. Using the paper cutter, I cut one of the copies into many pieces. 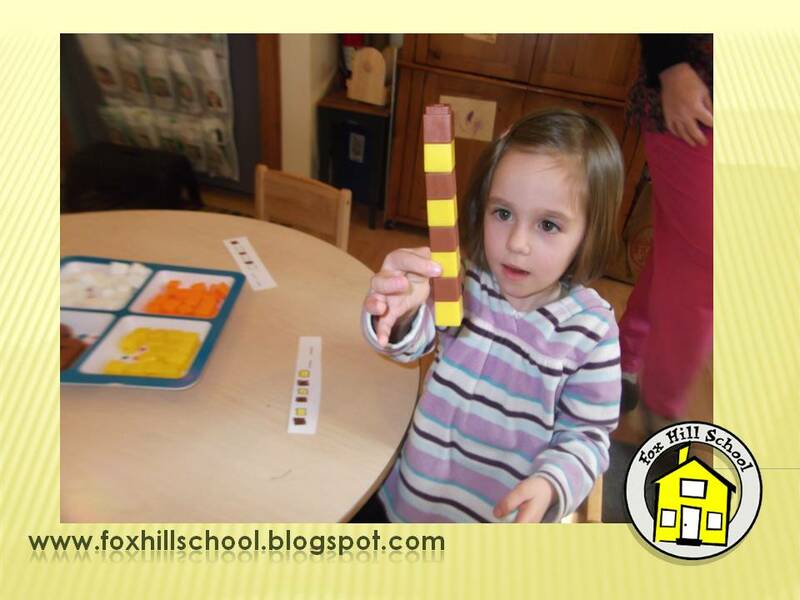 As a math activity, the children's task was to roll a die and put that many pieces of the puzzle on the picture. They could build the puzzle on top of the picture or next to it. We explained that when Van Gogh painted, he used dashes and swirls to create many of the paintings. 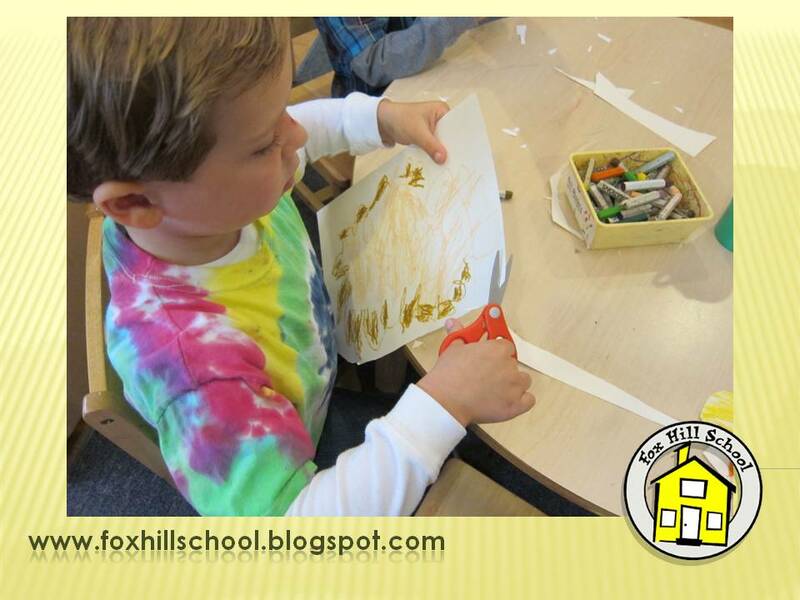 We gave the kids an example of what dashes and swirls look like and had them practice making the lines themselves as a fine motor activity. 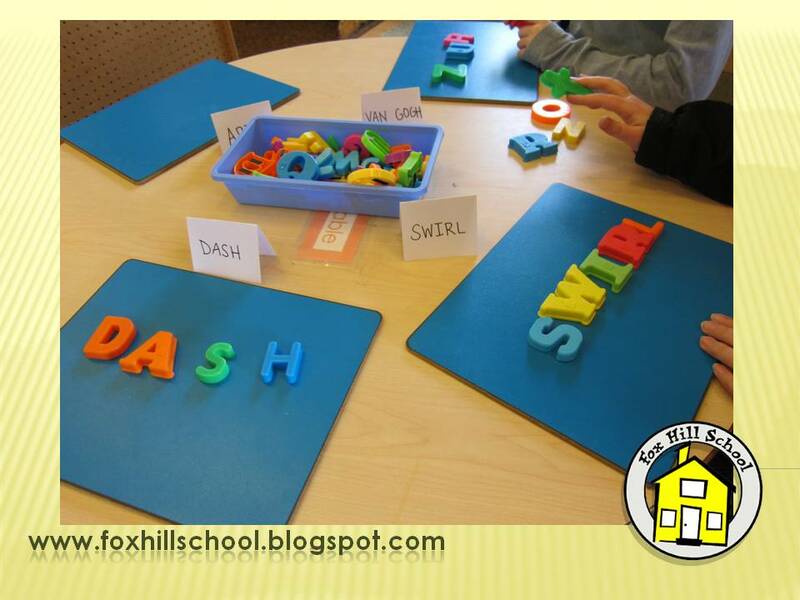 As a literacy activity, we wrote the words "art", "swirl", "Van Gogh" and "dash" on tented index cards and had the kids use the magnetic letters to create the words on their magnet boards. This is why we love literature based curriculum. We've given the kids fun activities across the curriculum and we're still only on the first page of the story! Here are some of the support books we use during our Vincent Van Gogh's Cat unit. Click on the book to purchase from Amazon. 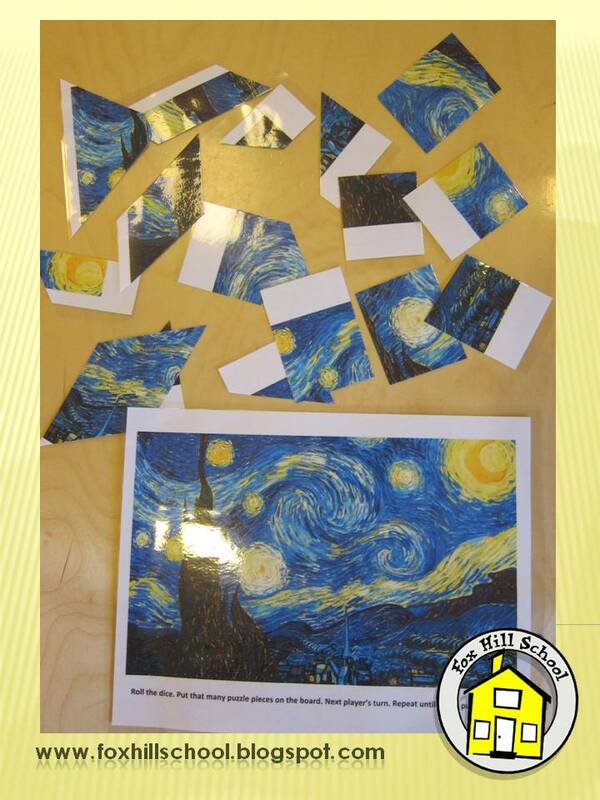 This week we started a new focus book called Vincent Van Gogh's Cat. This is a great story published by Scholastic that was written by a group of second grade students! The cat in the story has been cut out from famous paintings that the kids painted. I love using this book as a focus book because it is a great way to introduce kids to many of the great artists and their work. 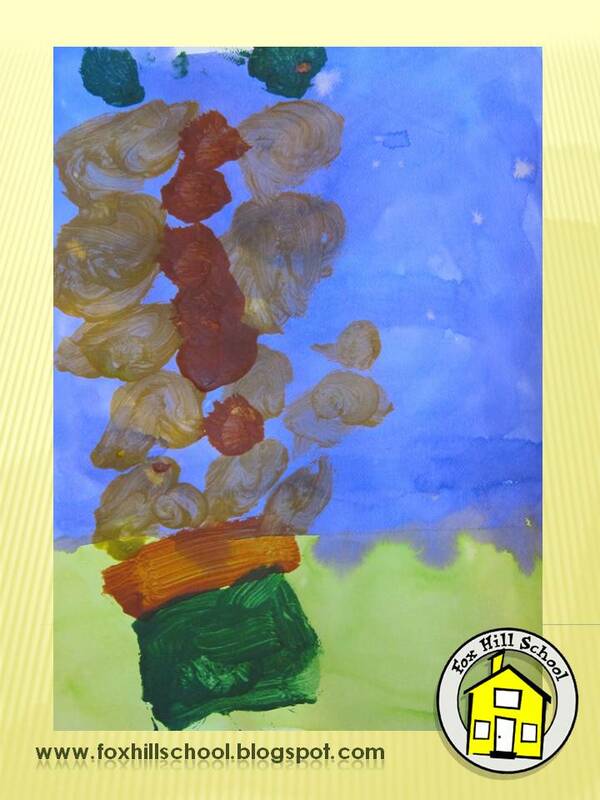 The first artist we introduced this week was Van Gogh, of course so we had the kids try to make their own version of his "Vase with 12 Sunflowers" painting. We explained that Van Gogh used very thick paint for his paintings called "impasto" and that they would be making a painting with impasto just like Van Gogh! 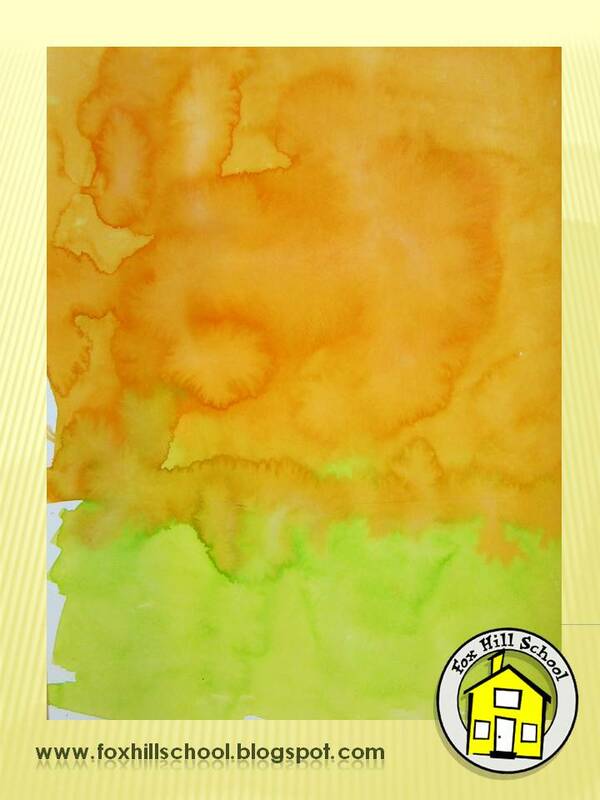 First we had the kids pick 2 colors of watercolors for the background - one for the wall, one for the table. 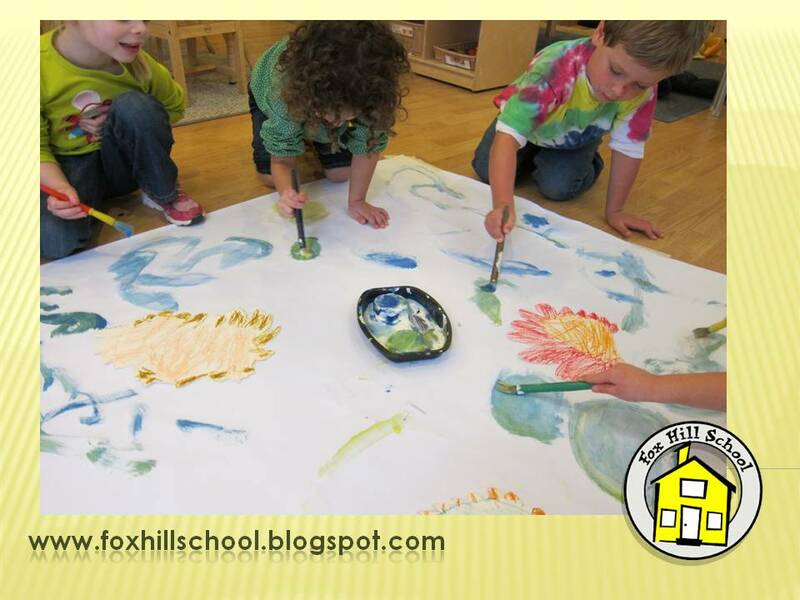 We used liquid watercolors and big paint brushes to cover the entire paper. 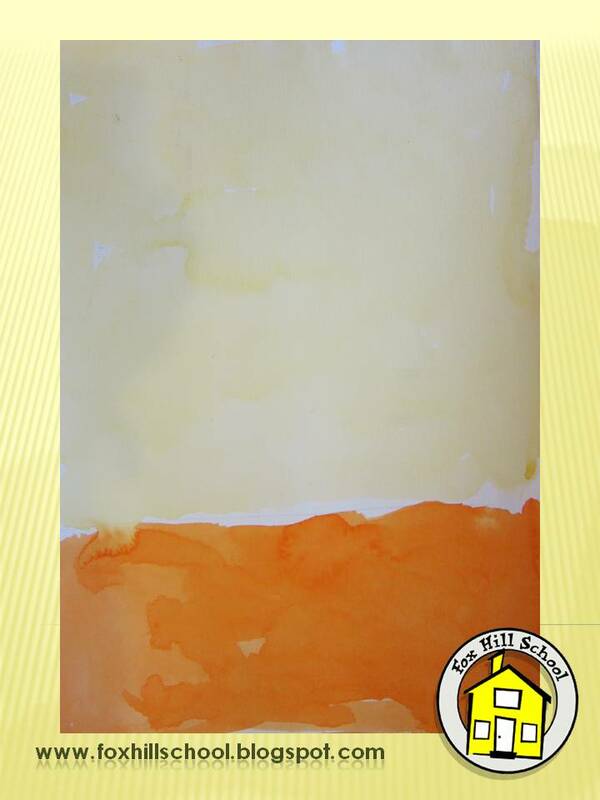 Once the backgrounds were dry, we made our impasto paint by mixing tempera paint with cornstarch or flour (depending on the allergies we have in each classroom. Both work great!) We also added some brown to the yellow, orange and green paint to more closely resemble the colors Van Gogh uses in his painting. 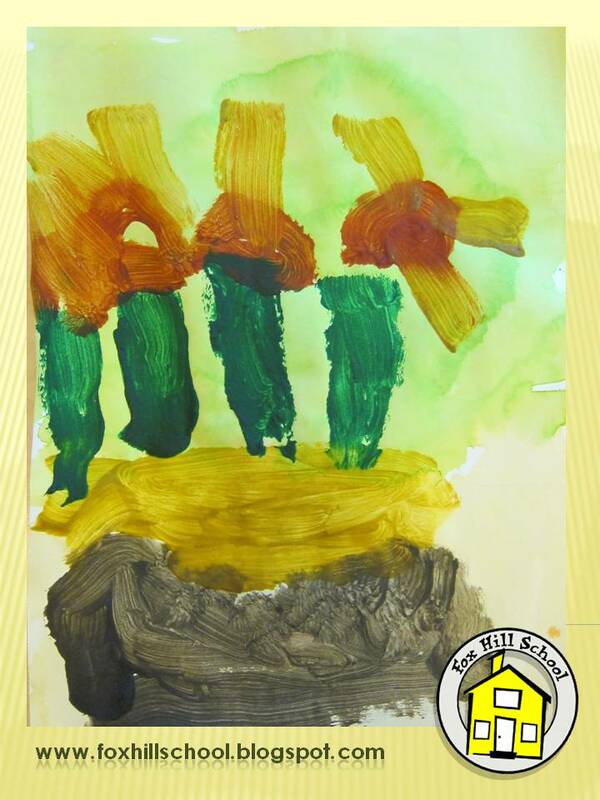 The kids used big brushes to paint their vases and sunflowers on their backgrounds, using a picture of the original work of art as their guide. Check out these amazing finished works of art! Here are some of the support books we have in our classroom that we use with the focus book Vincent Van Gogh's Cat. Click on the book to purchase from Amazon.